Watch out for Nikolay Angelov! This year's Bulgarian Open offered fine matches and interesting experiences for the international participants. And Bulgaria took the opportunity to display some great indigenous talent; Zhelyazko Valkov, a former national badminton champion won the veteran's class in fairly fierce international competition and, most notably, in one of the semi finals of the elite event, Nikolay Angelov pushed world no. 7, John O'Donnell (England) into tennis with only 8 points to recover(!) In the end he lost against O'Donnell but his over-all performance brought Angelov to no. 22 on the world ranking, a position that is bound to improve as a new sponsorship deal will allow him to participate at more tour events in the near future. At an age of ca(!) 26 he is a former badminton national team member and squash national champion. Watch out! 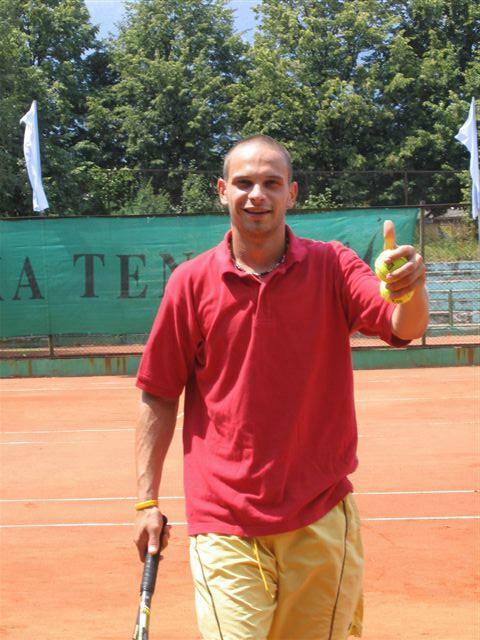 The runner-up in the in the 2005 Bulgarian Open veterans' class, David Greatorex, reports from Sofia below. 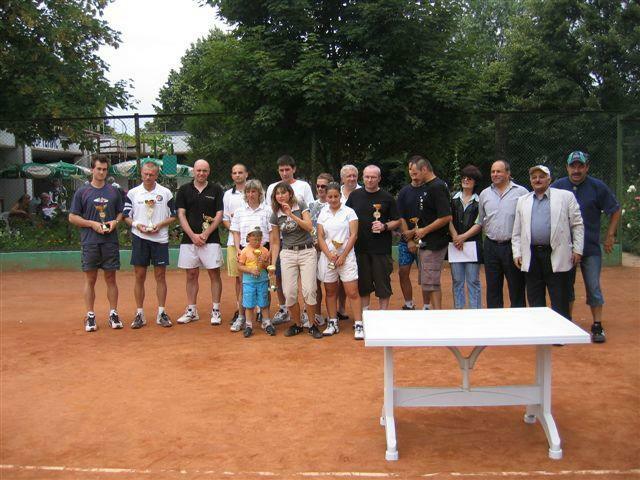 There were 34 entries for the 2005 Bulgarian Open held in Sofia on 16/17 July. World Champion Magnus Eliasson was the men's elite winner, beating English number 1 John O'Donnell in the final. In an all Bulgarian ladies event the winner was Irena Atanasova. Men's class 1 was also won by a Bulgarian, Nickolay Dudin. In the veterans final the former Bulgarian national badminton champion Zhelyazko Valkov beat England's David Greatorex. Tournament organiser Puzant Kassabian called a players meeting on Friday evening to decide the format of the men's event. It was agreed to put all the men in one field in the first round, winners forming the elite event, losers becoming the class 1 competition. Squash would be played first on the 2 courts of the Easy Club, players then transferring by car/minibus to the nearby Bulgarian Sports Academy where play was on 2 table tennis tables, 2 badminton courts and 2 outdoor clay tennis courts. In men's elite Magnus Eliasson continues to reign supreme. Fully recovered from the ankle injury sustained in Belgium, he was never seriously challenged. Michael Dickert of Austria was beaten +26 (sq 21-3, tt 18-21, ba 21-10, te -) in the semi final. Though Michael won table tennis, he was unable to force Magnus to the tennis set; . In the other semi, english squash guru John O'Donnell was given a fright by young bulgarian Nikolay Angelov. Their squash game was the highlight of the tournament; Niko played some beautiful volley drops and retrieved many seemingly impossible shots before losing 21-19. His weak table tennis gained only 2 points but dynamic movement and shotmaking won badminton 21-8 in a game that was much closer than the score suggests. O'Donnell needed only 14 in tennis....but we are talking JOD tennis here! The young Bulgarian got the start he needed, a double fault and net mistake from JOD handing him a 2-0 lead. JOD levelled at 4-4 and then a series of errors from Niko led to match point at 13-6, JOD finally closing out at 14-10 putting the end result at +12 (sq 21-19, tt 21-2, ba 8-21, te 14-10). But Niko has sent out a message to all elite players.With new sponsorship he will play four more tour events this year.Watch out!! The final had two very close games. Squash swung back and forth, Magnus leading 11-9 and 15-10 before JOD rallied to lead 17-15. Magnus recovered to 20-20 then had 3 match points before winning 24-22. In table tennis John was hoping to unsettle Magnus with his new anti-spin table tennis rubber but the unshakeable Swede remained solid winning 21-12. Badminton was a game of two halves as sunlight made visibility very poor at one end. JOD took the good end first and changed 11-10 up.Magnus broke free to lead 18-15, finally winning a very close game 21-19. So Magnus needed only 9 in tennis,an impossible task for John who lost 21-7. Can anyone shake the racketlon dominance of Eliasson?? Michael Dickert narrowly defeated Angelov +2 (sq 8-21, tt 21-4, bad 6-21, tenn 21-8) in the 3/4 playoff in a game of opposite profiles. Can Niko learn to play with the small bat?? Men's Class 1 was won by Nickolay Dudin of Bulgaria, beating his compatriot Zhivko Sinilkov in the final. (no scores available). In a ladies event with no foreign entries, Irena Atanasova beat Aneta Yaneva in the final (again,no scores available). Veterans had 2 Bulgarian and four foreign entries: Bogdan Miezynski of Poland, Hubert Fromlet (Sweden), David Greatorex and Chris Davison (both England). In the semis, Zhelyazko Valkov beat Davison while David Greatorex avenged his Belgian Open defeat against Bogdan who was suffering badly from tennis elbow. Zhelyazko was many times Bulgarian national badminton champion before quitting to become a good squash player. To save time, tennis was played first in the final, Zhelyazko showing solid form to win 21-14.Table tennis is his weakness and he managed only 3 points. Expecting to dominate badminton, he was shocked when David took a quick 5-0 lead but recovered to win 21-15. After a few points of the final game it was obvious that David's inexperienced squash would not get the 17 points required. 21-6 left Z the winner +10 (te 21-14, tt 3-21, ba 21-15, sq 21-6). Bogdan Miezynski was third. A player's party was held on Saturday night in a very nice squash/swimming club in Sofia. Puzant was a marvellous host, introducing us to 'Rakia' a Bulgarian brandy which tastes like a very strong Scottish malt whisky. Truly 'fire water'!! It was a very long night for some of the visitors. The weather was excellent, hotel superb and food and drink very cheaply priced. Many thanks to Puzant and his team for their tremendous hospitality. Hopefully more foreign players will make the trip next year. Racketlon is alive, well and developing with enthusiasm in Bulgaria!! 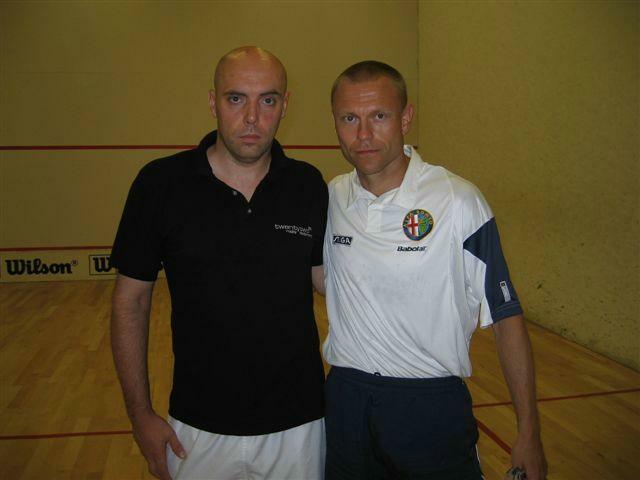 Bulgarian Open 2005. Some of the participants and the organiser Puzant Kassabian (in light jacket, second from the right). The author of this article, David Greatorex, 5 steps further to the left, in all black.